Of all the statistics available for our recently completed road trip through the heart of America, the most telling is the 95 hours of windshield time. On a trip of almost 5,000 miles, that may not sound like much, but it equates to more than two weeks taking in a broad view of America. We saw so many incredible things that reminded us of what a great and diverse country America really is. In Colorado, we crossed 11,000 foot mountain passes in the shade of 14,000 foot peaks. We watched the sun rise over the snow-crusted Black Hills in South Dakota. We drove across miles of prairie, marveling at the farms and fully appreciating why it is called America's breadbasket. We camped in Tennessee woods that were thick and damp and full of strange and wonderful trees such as oaks, maples and hickories. We traversed 13 states and found it all amazing and worthy of far deeper exploration. However, there seemed to be a progressively more significant change as we traveled east, starting at about Denver, Colorado. It became an increasing challenge to find public land on which to recreate and competition for what was available was intense. I wondered if this was just my perception, so I did some checking, starting with the Bureau of Land Management. Of the 188 million surface acres BLM manages in the Continental U.S. (I’ll leave Alaska out of most of this), only 30,000 total acres are in the 31 states east of the Mississippi River. From North Dakota through Texas, there are another 1.7 million acres of BLM, leaving 186 million acres for Westerners to play on. Next, I checked with the U.S. Forest Service statistics. In the Continental U.S., there are 153 national forests that encompass 170 million acres. 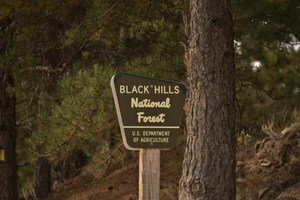 Eighty three percent, or 141 million acres, of national forests are in the 11 western states. Thirty seven states share the remaining 29 million acres. In contrast, Idaho has 10 national forests with 20 million combined acres. We are tied with Oregon and Montana, and are second only to California which has 14 forests. Idaho also has 12 million acres of BLM land. We rank fourth in the percent of public land within our boundaries, behind Alaska, Nevada and Utah. We have all heard the debates and complaints about "too much federal land in Idaho," as if it is a curse that thwarts development. From my recent experience, I would propose that as America and Idaho continue to expand, the real and intrinsic values of this open land may grow far beyond what commercial interests see. This federal land is part of what makes Idaho unique and wonderful and without it, we would be something less. We have places where we can hunt, fish and camp almost literally outside our doorsteps. We don't need reservations and we don't need permission. This ground, so long as we take care of it, is open to the public. Take a road trip back east and you will understand how fortunate we really are and why our eastern brothers and sisters love to come here. You find far fewer signs like these as you travel east across the nation. Plentiful public land is arguably Idaho’s greatest treasure.